You’d be forgiven for not having the foggiest idea who Antidemon are. In short, they are a death metal/grindcore act from São Paulo in Brazil who formed back in 1994. Over their 22 year period of activity they have released 4 full-length albums and a whole host of other things. But it’s the first album that I’m going to be drawing attention to in this article. Rewind to 2009. I was living at my parents’ place in Preston and I’d just started to get into metal. Growing up in a Christian household, rock and metal were seen as OK but only Christian based artists were allowed. Now up to this point, I’d been listening to bands such as Skillet and had just started to get into stuff like Metallica and Stone Sour. My sister showed me a site called Crossrhythms and they had a giant database with a list of artists/bands in it where you could filter by genre. So, I did what any budding metalhead did, I filtered it by metal and had a look through the bands. The first couple were not really for me and then I came to this one, called Antidemon. After listening to one of the songs of Anillo De Fuego, I wasn’t particularly convinced but I figured I’d give their previous album, Demonocídio a try. And I was blown away by it. The raw energy of the music ignited something in me, which has still lasted to this day. After finding a copy of the album, I started playing it pretty much non-stop for weeks. It was my go to music and acted as by diving board into the more extreme end of metal. But for some reason, I drifted away from it and didn’t listen to it as much before pretty much neglecting the album for about a year and half. As a result, I kind of lost the energy I once had for metal and started drifting away. That all changed however when the song “Viagem” started playing when I was in a kind of dark place about 18 months ago. All of a sudden, that passion and energy I once had came flooding back to me. I thought to myself, “You know what, I’ll play the album through again.” No sooner as the title track started, I was flooded with a passion to change things around and start doing things again. So in a way, you can credit this album for my resurgence in articles for the MT and a couple of other things. I must have listened to the album nearly 1,000 times and whilst all the songs are really good, there are a few songs in particular that resonate with me. “Causas alcoólicas” with its awesome groove and meaty bass line is one of the more simplistic songs on the album. But it’s raw energy and overall mid-pace are what set it apart from the others. Whilst “Massacre” is one of the longer songs on the album, it still features one of the best ‘chant style’ sections I’ve ever heard. Couple that with an ascending riff and you’ve got an instant classic. “Ida sem volta” is, in contrast, one of the shortest tracks on the album. However, it still gets it’s message across and proves that sometimes you don’t need to beat about the bush. “Escravo do diabo” shows off the skill of ex-drummer Elke by having spots wehre the other instruments drop out and the drums provide a fill to kick things going again. Having a similar vibe to “Massacre”, “Mundo cão” has an equally amazing riff whilst including some of the speed shown in the other songs on the album. Then we have “Viagem”. The song that reignited the fire. The second longest on the album, it features the backing vocals of ex-gutiarist Kleber alongside the growls of frontman Carlos Batista. Dropping down to bass and drums around the 2:17 mark adds a side of edge to the song before the guitars return to bring the song to a close. So what is it that makes this album so special to me? Is it the lyrics? The music? The fact that the production is excellent? Or is it a combination of all of them? I honestly cannot tell you. But what I will say is this… If you’re a fan of the more extreme side of metal then you should definitely check it out. It’s quite unlike anything else out there. 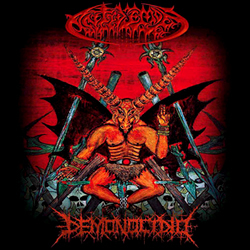 Demoncídio was released on October 26th 1999.